When you think of Philadelphia what comes to your mind first? Is it the Philadelphia Eagles winning the Super Bowl for the first time in history? Take a look at these Eagles fans in the video below. And see what it means to many fans in 2018. How about the film Philadelphia where Bruce Springsteen sings “The Streets of Philadelphia”? Watch Tom Hanks Oscar-winning acting where he plays a gay man in 1994. Or is it the movie “Rocky” where Sylvester Stallone plays a struggling Philadelphia boxer? Watch and listen to “Gonna Fly Now” or “Theme from Rocky” as Rocky works out and climbs the Philadelphia Art Musem steps. But wait. Before you watch the videos, you might want to grab some food at the Reading Terminal. It’s the oldest continuously operating farmer’s market that caters to those who like authentic Philly cheesesteaks and traditional Pennsylvania Dutch or other delicious delights from other parts of the world. Reading Terminal is a food paradise and the one most visited attraction in Philadelphia. How about visiting Philadelphia City Hall? 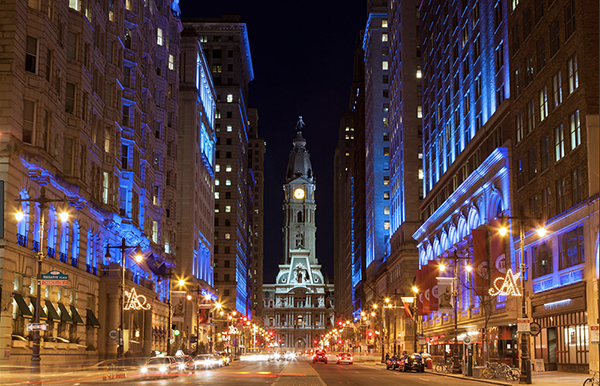 Did you know that Philadelphia City Hall is the largest city building in the U.S? What separates Serkes Marketing from our competitors is not only do we understand digital marketing, but we also understand those who don’t. Our marketing experience gives us a unique perspective and patience for those who are confused, threatened or just plain overwhelmed by digital marketing. We specialize in turning that negative thinking around, instilling a can-do attitude and guiding the company through the maze of options and opportunities. It’s most valuable for us to develop relationships with clients and focus on their primary goals. Look for us to help you with SEO, local SEO, PPC, website design, social media and graphic design. Are you in the Philadelphia area looking for website design or SEO services? Serkes Marketing is a top Philadelphia SEO digital marketing agency. Our specialty is marketing strategy, SEO, PPC (Google AdWords and Facebook ads), website design, and graphic design that attracts prospects and converts them to new customers. Call(610) 668-3020 today to start turning more contacts into customers. If you have a website, SEO is more important than ever. It can help your business grow. SEO helps your website rise to the top of an online search. The top three sites in search results get 60% of clicks. SEO improves the user experience of a website. By having a presence in the top positions for keywords, the site becomes more trustworthy. SEO is useful for users to promote your site through social media. If a user finds your website on Google, they are more likely to engage with it on Facebook, Twitter, or other social media channels. SEO keeps you ahead of the competition. If a website is higher in search results than another website, the search engine optimized site is more likely to have more traffic and more sales. SEO drives 300% more traffic to sites than social media. What are the top five SEO tools? The following SEO tools are critical to your organic search strategy. Google Webmaster Tools are beginner-friendly and explain Google’s basic search elements. Best of all you can see your website the way Google sees it. Check out your PageSpeed Insights. It gets measured for desktop and mobile. Page speed is essential to businesses that don’t want to lose visitors that come to their site. SEMrush is a powerful dashboard that offers many features. You find out how your website ranks for a keyword, what is the monthly volume and more. Other features include comparing your website’s performance to your competitors, on-page SEO opportunities and what backlinks your website gets from other sites. Screaming Frog SEO Spider is a search marketer’s best friend. This program crawls your website for common SEO problems.